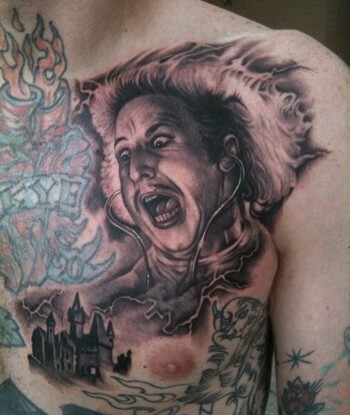 While researching for an essay about my extreme attraction to Gene Wilder as Dr. Frederick Frankenstein in Young Frankenstein, I came across tremendous tattoos of him in various poses of yelling and screaming. This got me Googling tattoos of other films and characters that I adore and I was struck at the extreme dedication of some fans and the impressive talent of so many tattoo artists. 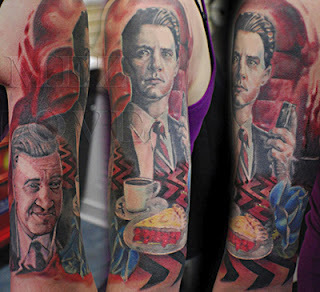 Below are my favorite movies and TV shows as seen by tattoos. Unfortunately, I had to edit my list since 1.) I could not find any tattoos of the movie Secretary or of James Spader. When Googling, “Secretary Tattoo”, one ends up with a page full of aesthetically questionable women in secretary outfits licking a man’s swollen…and 2.) Surprisingly could not find any Spinal Tap tattoos except for a pretty lame Shark Sandwich one and 3.) Also could not find any Kids in the Hall, Newsradio, or Six Feet Under tattoos. 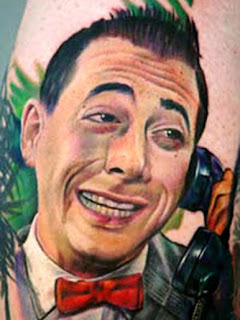 Pee-Wee’s Big Adventure– When I was a little girl, I used to put on white patent leather platforms that my Grandmother kept in her clothing store as a “boost” for brides trying on their future bridal gowns. When they weren’t in use, I would put them on and stand in the store window doing the “Tequila” dance for passersby. 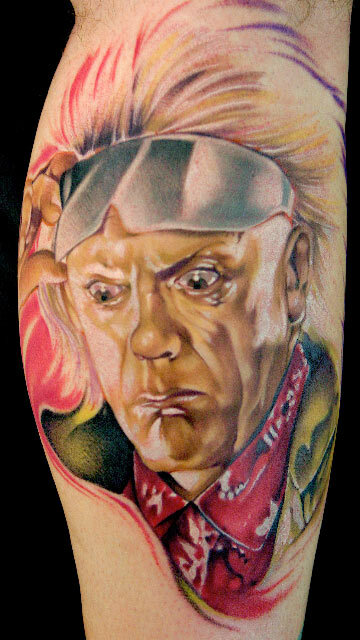 Back to the Future– My first tangible crush was on Doc Brown. At the age of eight, I would doodle his name over and over in my notebook. I used to imagine what it would be like living in his workshop and taking second to his machinery. Annie Hall– I’ll never forget the first time I saw Annie Hall. I was fifteen years old and my mind had just been blown with the realization that there were people out there like me. Quirky people. Neurotic people. People who nervously and incessantly talked about themselves while flailing their arms around. Young Frankenstein– Gene Wilder might have been my second crush. I just wanted to run my tiny little girl hands through his mass of cotton candy blonde hair all day, every day. Stop Making Sense– I’ll never forget the first time I saw this movie. I was sixteen and rented the 15th Anniversary DVD of Stop Making Sense. By the end of the first song, Psycho Killer, I was floored. I had never seen a singer act so…so….weird! Halfway through, when the lights grew dark and David Byrne appeared with a lamp in front of giant panels displaying conceptual photography, I realized that I was in love. Beetlejuice– At about six, I watched this movie every day for three months straight much to my parent’s dismay. Another dance that I would share to no one in particular was the “Day Oh” dance- equipped with awkward facial expressions and fall over at the end. Any Marx Brothers Movie– I must have been around thirteen when I first saw the Marx Brothers. I was struck at how their humor- 1920’s/1930’s humor- seemed so timeless. In fact, even now there is nothing quite like it. 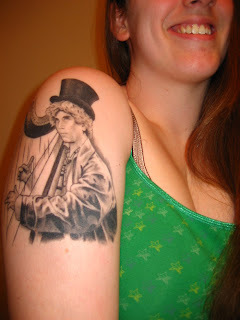 My favorite Marx Brother is Harpo- always and forever. 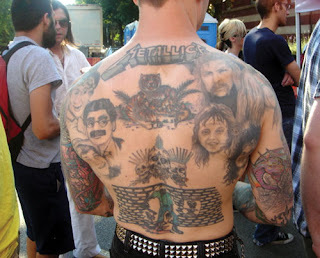 Obviously this man really loves the Marx Brothers too….and Metallica. Don’t you remember Larso Marx? Twin Peaks– I rented the entire series of Twin Peaks on VHS from our local Hollywood Video my senior year of high school. I could not peel myself away from the TV for two weeks while I anxiously awaited each episode. By the time I watched the finale one morning at 2AM, I nearly pissed myself in excitement. I woke my boyfriend up and shouted, “Cooper is in the Red Room!” and he mumbled something about my weirdness and went back to sleep. X-Files– Mulder and Scully are the reason why I have trouble dating. They pummeled into me that relationships should be awkward and difficult and drawn out. I watched every single episode of this show and tried nicknaming myself “Spooky”- but it didn’t hold. Arrested Development– Well, there is nothing that can be said for how amazing this show was. Any words I may use will just pale in its awesomeness. That Annie Hall tattoo is freakin' fantastic! Also, you can't go wrong with Tobias on your arm for eternity. P.S. 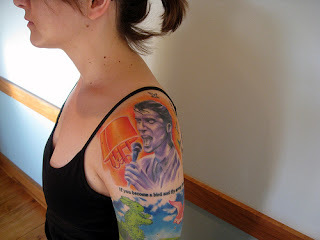 I'm surprised I never took the plunge and got a "Six Feet Under" tattoo – that little tree on the hill would look pretty sharp somewhere on my body. The Beetlejuice ones are nuts!!! The Pee-Wee ones too. 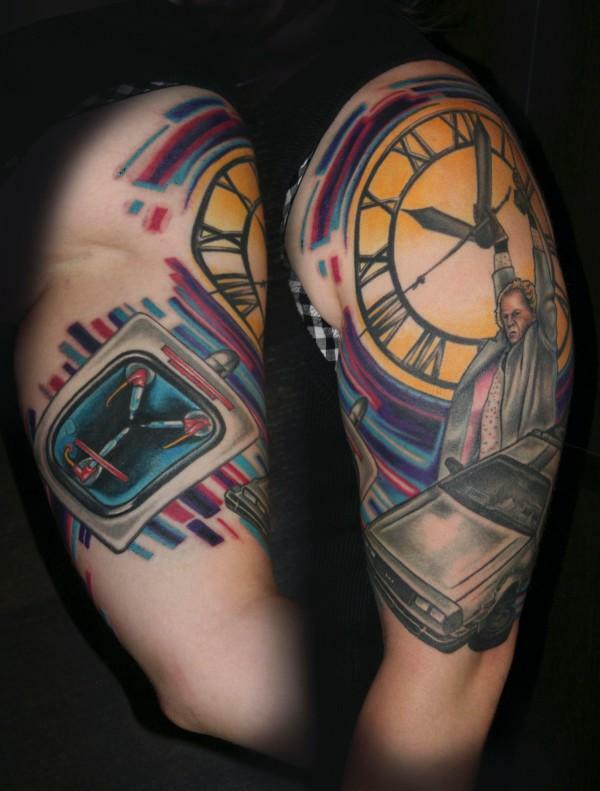 I love the Back to the future ones! What a shame no Secretary ones. That movie is badass! While I've never been a fan of tattoo's I have to admit those are awesome ones. 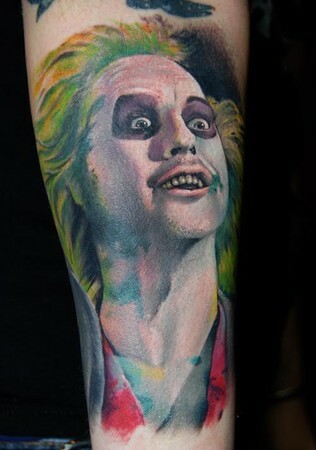 The Beetlejuice ones are incredible actually. Wow! 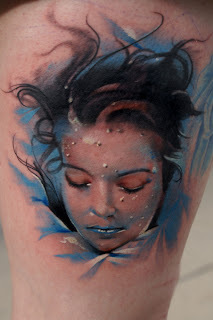 Amazing tattoos! 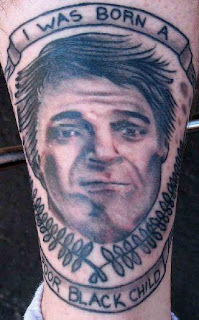 Steve Martin's face in The Jerk tattoo – fantastic! 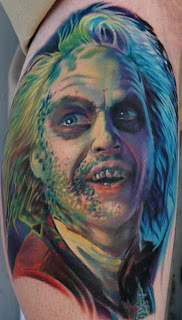 Also, those Beetlejuice tattoos are sweet. Love them and that movie! These tattoos are blowing my mind. Coffee and pie! Young Frankenstein! 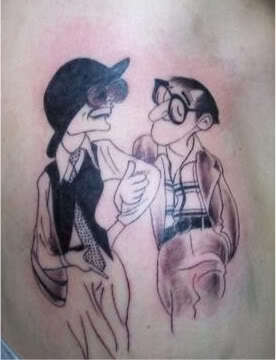 Annie Hall! Makes me itch for some ink. @Vanessa- Oh my gosh, you're right! The "Six Feet Under" tree would be incredible. You should do it! @Melanie- The Beetlejuice ones are my fave. The artist is really good. Especially the top one. @B- I always love dressing up as male characters for Halloween. This year is Freddie Mercury! 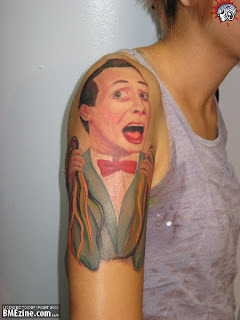 You should do Pee-Wee this year! @Jessica- The Twin Peaks ones are pretty impressive. Especially the one with Lynch! 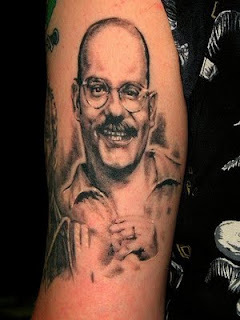 That portrait of David Cross is pretty stellar, though I think if I had a choice I'd get Jack Torrance getting hit in the head with a baseball bat by his wife in The Shining. haha! Those are some of the coolest and weirdest tattoos I've seen, ever. 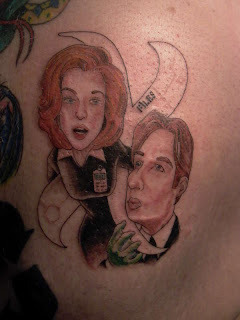 I kind of want to marry the person with the X-files tattoo. I'm off to google saturday morning cartoons from the 80's tattoos now. Cool stuff. Last night I had a lengthy argument with my mother over Scullzer and Muldy. She says they needed 'unresolved sexual tension' which is why they never kiss. I say they need a hot and steamy mack-out sesh, once a season, just as a teaser. RIGHT?